Prepare to be overwhelmed. That’s not an understatement, because you will be overwhelmed by Stefan Feld’s Bora Bora, from the moment you open the box roughly to the end of the second game. Then you get that moment of clarity where you understand how everything fits together and can actually start really enjoying the game. Promise. Opening the box, you get overwhelmed by all the components: 267 cardboard tiles, 118 wooden pieces, a deck of cards, a game board and 4 player boards. I’m sure there are games with more components, but the alea standard box is full to the brim. Next, you will wonder what you got yourself into when unfolding the game board: while the left side is a map of Bora Bora with one main island and four smaller islands, the right side has tracks, and fields to place cardboard tiles and then some of each. But the real feeling of mental inadequacy sets in when you look at your player board. Every centimeter there is packed with information, best take a moment to just look at it before you try to comprehend. 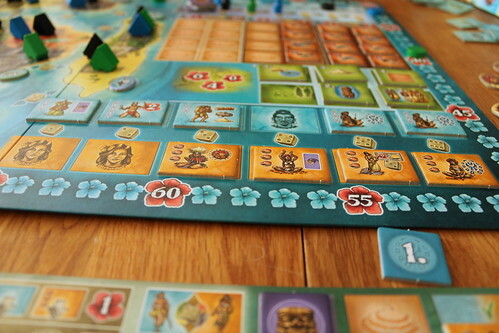 Fortunately, the player board is the only component I would point some criticism at: while everything else looks great and does a good job giving you a simple view at the many moving parts of Bora Bora, the player boards are too densely packed. With all the components already in the box, splitting them into one actual player board and one player aid per player – because half the board is just that – can’t have been a huge additional expense. 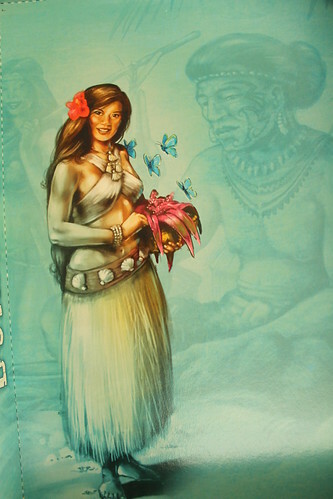 Like most recent games, your goal in Bora Bora is to finish the game with more victory points than everyone else, but the options how to score are, again, overwhelming: you score points for the gods favour, catching fish, having jewelery, living next to fish, putting jewelery on fish – okay, that one was a lie – building huts on the board, building ceremonial huts on your player board, having men and women live in your huts, sending priests to the temple and completing mostly arbitrary tasks. And to do all that, you only have six rounds with three dice to choose actions each round. Dice are, of course, Feld’s favourite component, and I imagine him staying up at night cackling to himself as he comes up with new ways of using them to force players to make agonizing decisions. 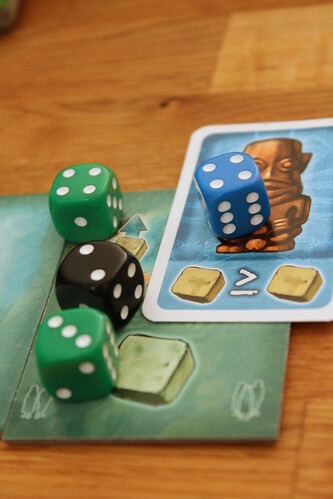 In that, he succeeded yet again: the dice mechanic in Bora Bora is agonizing again. All players roll their three dice at once and then take turns putting it on one of the five to seven action tiles and taking the corresponding action. The higher the number rolled, the more powerful the chosen action. But higher numbers are harder to place on actions because the value of a new dice on an action tile must always be lower than the values already there, baring divine intervention with the Blue God card. Placing a one on the action all your opponents needed is not likely to make you friends, but all the more likely to make you successful. Who needed friends, anyway? To keep choices tough and space limited, some actions are combined into one tile when playing with less than four people. It works, you’ll hate the other players no matter how many they are. Now you’ll likely want to know what those actions do that you select, but that’s where things get difficult. The beauty of Bora Bora is how everything is linked in one way or the other. Unfortunately, that makes every possible order of explaining the game not ideal because you’ll always have to say “I will explain that in a moment”, an expression everyone that ever listened to a game explanation hates. That is also why it takes until the end of the second game to stop being overwhelmed: the first one just to understand how everything is connected, the second one to figure out how to make use of those connections. And taken by themselves, all the actions are so simple. Take Expansion, for example: from one of your huts you may follow an arrow to another region and build a hut there. The arrows show a minimum dice roll you have to place to use them, so a higher roll gives you more choice. Easy, right? But expanding gives you one of the game’s three resources needed to build your ceremonial huts, or a fruit basketOffering needed to play god cards. It also gives you a fish to score at the end, unless someone else fishes it up when he settles in the same place. And it frees one space on your player board to place a Man or Woman tile. And expanding to the whole island is worth bonus points at the end of the game. And having huts on specific regions is required for some goal tiles. That’s how entangled the actions are, and while the whole thing seems impossible to see through at first, it also means every decision you make has many implications. When you make a decision in Bora Bora, you know that you just made a decision and could have a small snack now, thank you very much. The other actions are not less entangled, but I’ll skip some of the details for your sanity. The Man and Woman actions let you chose a Man or Woman tile, respectively, to put in an empty spot on your player board. These people are important in the second phase of each round. With the Build action you build one of your six ceremonial huts, scoring a bunch of points – provided you have the right resources from expanding, of course. The Temple action sends one of your four priests to the temple. And the didn’t-fit-anywhere-else Helper action lets you buy things for the score of your dice: one point of the die allows you to activate one Man or Woman, giving you Tattoos or Shells. Oh, I hadn’t mentioned those yet, had I? There we go again, many connected parts. For two points, you can have a fruit basketOffering, any of the three resources or a god card. Finally, the temple action puts one of your priests in the temple for later profit. But all that is only half the game, when all those actions are taken, your Men and Women come into play. Each of their tiles shows one action, mostly the ones also available through dice, and you may execute one Man-action and one Woman-action. No matter how many you have, only one action per gender. But you still benefit from having more available because multiple tiles with the same action amplify the effect while still counting as one action. Yet another thing to look out for: getting the right Guys and Gals together for your strategy. To end the round, all that is left to do is going down the right side of the board. First you check who got the most tough guys tattooed this round to adjust the player order. This step coming first is important because the new order is already in effect for the next steps. Next, the temple awards points and super god tiles that can be used as any god card to the player with the majority. Boring. More interesting is the Jewelry Shop where you buy, surprise, Jewelry. This is where you spend your shells, the tiles you buy award victory points. Finally, you pick one of your goal tiles to fulfil and score points for – anything in the game can be a goal: having a certain number of Shells, Resources, specific Resources, having huts on the right landscapes, or next to the right fish, or having enough men or women at your disposal. Anything. Afterwards, each player picks a new goal tile and the round is over. The other five rounds have the same steps, but they never play the same. You’re collecting new Men and Women to give you new options in that phase, but even the dice phase where your options stay the same, circumstances change too much that each round is a new challenge. Made worse by the gods-damned dice that only ever roll three sixes when you go last. Starting on the second round, the dice phase has a lot of interaction as well. While there is never any trading or negotiation, being aware what the other players might want to do, what numbers they have and then tripping them up is important to success. After the last round, you can score many, many bonus points still. Having all your huts built, all the empty spots filled with Men and Women, completed all the goals, buy six pieces of jewelry… for most of these bonuses, you have to start working for them from the first round or forget about them right away. But then, we’re still not sure how important those bonuses are: with all the ways to score in Bora Bora, the six points for each bonus don’t seem all that impressive. And that’s one thing to like about Bora Bora, next to the intricately intermixed actions and resources: you have so many options available that no one is going to publish the ideal strategy any time soon. You also have so few actions per turn that you never even get close to doing everything you want. That’s in best, classic Stefan Feld style: the man loves to see his players in agony, and Bora Bora delivers on that count. No decision can be taken lightly, because everything is somehow connected to everything else and can come back to bite you three turns down the line. There is a bit of a downside, to that: you guessed it, players that try to think things through really, really slow the game down. Even with quick players, a four player game will go on for two hours, maybe more, and you spend much of your time waiting for the others. The sweet spot seems to be three players. The roughly 90 minutes it takes to play are justified and don’t unduly stress your patience. Another small point of criticism is the amount of luck involved in Bora Bora. It’s not even the dice, it’s the dice plus the god cards, plus the new tiles in every round that can screw you over. When your dice come up bad, you can compensate. When there is no goal tile you like, you can still deal with it. No Men or Women that help your goal? You can compensate. But a bad goal, bad people and then you roll badly? There is very little you can do about it, and having one round messed up like that will cost you the game, even with the best strategy in place. It’s not a common problem, but it does happen. 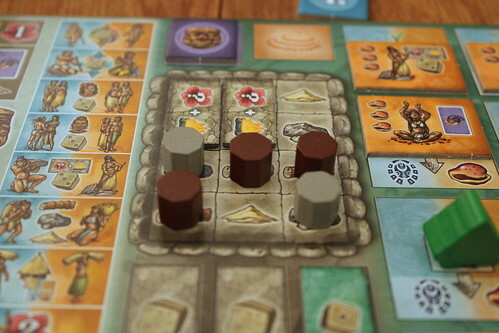 But despite these spots of luck required, making the right decisions is still the much bigger factor to success, and that makes Bora Bora a very good and typical example of a Feld game: every decision matters, every decision is painful, and in the end you had a lot of fun and maybe a slight headache.